I haven't added anything here since 2006 but it's instructive to see how we had to do things before every person was their own broadcasting station. The files are rather large so don't try downloading them with a dialup connection. I could have used a smaller screen size and applied heavier compression, but posting tiny, blotchy nature videos would be rather pointless. File format is Windows Media Video (.wmv extention) which should play on computers with MS Internet Explorer browser. I'm not planning to attend any Academy Awards presentations in the near future, but I think there are some interesting moments in these little videos. New: Backyard Turkeys - The videocam sat idle for 2005, but when turkeys appeared in my yard in 2006 it came out of mothballs. 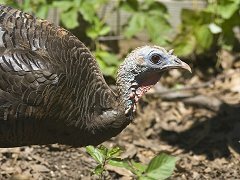 The long version includes some of the other critters that hang around the feeders along with the turkeys, the short version is a turkey by itself. 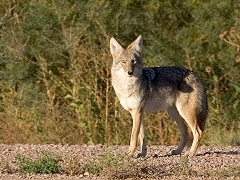 Coyotes in Bosque del Apache - October 18, 2004 at Bosque del Apache National Wildlife Refuge, New Mexico. I expected cranes would scatter at the sight of a coyote, so I was surprised when they stood their ground. 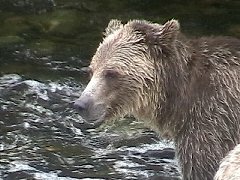 Grizzly Bears of Knight Inlet, BC - Taken September 10 and 12 at the Glendale salmon spawning channel, Knight Inlet, British Columbia. 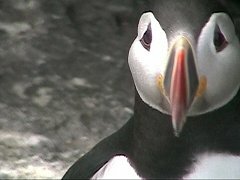 Puffins of Machias Seal Island - Shot June 8 and 9, 2004 Machias Seal Island in the Gulf of Maine. Braintree Hawks - Shot between April 27 and June 10, 2004 in Braintree, Massachusetts. I replaced the sound with music. Most of it was shot through window glass and there was no sound from the outside, and all you could hear on the scenes shot outside was traffic noise. This is the third year this red-tailed hawk pair have raised chicks in this nest. Most of the shots are centered on the nest and the twins, but near the end there is a scene of one of the parents sitting on the building and getting mobbed by mockingbirds. The hawks have to put up with this annoyance constantly, and may be one reason why we didn't see the chicks for very long after they left the nest. I didn't get any shots of the chicks flying, so the last two scenes show the chicks as they get ready to leave. I wanted to have a version available shorter than the original 15:30 epic, and after three rounds of cutting was able to come up with a 6:40 version. In 2005 I was away from the office except for one day and was only able to get a couple minutes of clips with my S45 shot through a telescope. 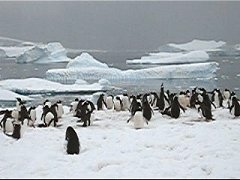 Antarctica - Even though the video quality isn't that great, I think this is worth a look. There's a lot of wind noise on this one so you might want to lower your sound, but turn it up at the 2:00 mark to hear the penguin colony. 1"Chromatic aberration" is the color fringe (usually purple) around objects that you see on some images. It's a common problem with inexpensive zoom lenses. The best solution other than buying better equipment seems to be to avoid conditions which cause it. The "Braintree Hawks" video has several examples where the birds are set against the background of a white building. As soon as the birds got big enough to see over the nest, I moved my shooting location from the fourth floor to the third floor to get a darker background. For a more complete definition of chromatic aberration see this glossary entry at DPReview.